The Shenzhou VII crew received a heroes' welcome when they returned to Beijing Monday morning after completing a historic 68-hour space voyage that included the country's first spacewalk. China became the third country to conduct a spacewalk after the United States and Russia when Zhai Zhigang emerged from the spaceship's airlock module for 20 minutes of spacewalk on Saturday afternoon. The spacewalker and his crewmates Liu Boming and Jing Haipeng, all 42, who had spent a decade in training, safely landed on Sunday afternoon in the Inner Mongolia autonomous region. They were later transferred by three separate helicopters to Hohhot, the region's capital city, where the trio spent the night resting after receiving a half-hour physical examination. The head doctor said all three astronauts were in good health. Back in the nation's capital, people from around the country flocked to the Beijing Aerospace Control Center (BACC) since Sunday, all hoping to catch a glimpse of the three men. Traffic was up by some 40 percent Monday, according to local police. Nearby businesses also had the astronauts to thank. The manager of a restaurant close to the center said business had never been so good since the Shenzhou VII mission began on Sept 25. Standard room rates per night for a local hotel soared from 200 yuan ($29) to 600 yuan. And Monday morning, more than 5,000 people welcomed the heroes home just outside the BACC, the site of the ground control center for the Shenzhou missions, as well as the astronauts' training site and homes. 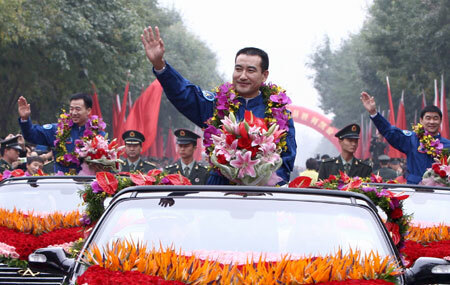 Crackers, gongs and drums, as well as Chinese flags and colorful balloons greeted the heroic trio as they returned, riding in three open-top sedans with garlands around their necks. The 2 km journey from BACC's eastern gate to the astronauts' apartments took half an hour for the sedans, surrounded by cheering crowds. Zhai and his crew are expected to undergo a two-week quarantine in the center's medical facilities. Medical experts say the astronauts remain vulnerable to viruses on Earth. They are required to keep a two-meter distance from everyone else during the quarantine period, experts say. It had been a sleepless Sunday night for a great many people inside the BACC. Lin Ruichu, a technical director with its astronaut training center, said he had spent the night partying. "We've had our hearts in our throats for the past four days. Emergencies (with spaceflights like these) are random and unpredictable. It was only after the spaceship landed and the astronauts declared themselves fine that we dared breathe a sigh of relief," he said. As youngsters partied through the night, 66-year-old Dong Qinguang, a BACC veteran, stood by their side with smiles and pride. "I've been in the field for 37 years. The seven Shenzhou missions have been increasingly successful each time. This is definitely the most exciting and happiest night for me," he said. People all around the nation were thrilled upon the return of the astronauts. In Qiqihar in Heilongjiang province, Zhai and Liu's hometown, people swarmed the city's largest square on Sunday to celebrate their townsmen's success. Since 2003, China has sent six astronauts into space, including the country's first, Yang Liwei, who is now a major-general responsible for astronauts' training, and the first pair Fei Junlong and Nie Haisheng. Sources with BACC and Jiuquan Satellite Launch Center in Gansu province say a new generation of no more than 14 astronauts, which will soon be picked, will fly Shenzhou X, China's next-phase manned space mission in 2010.